Gaining understanding of something often requires that we take apart what we usually experience as a unit. We have to analyze. But we often fail to truly understand until we also do the reverse—until we take bits and pieces we usually experience separately and fit them together into a whole. We have to synthesize. The combination of analysis and synthesis is nowhere more vital than in the study of Scripture. Sadly, synthesis is sorely neglected. What keeps sound preachers and teachers of the Bible out of the interpretive ditches is often not how well they do word studies and grammatical analysis, but how well they relate the passage at hand to the flow of the chapter, section, book, testament, and Bible as a whole. Given the general neglect of synthetical Bible study, I was delighted to hear of Scott Bashoor’s recent publication of Visual Outline Charts of the New Testament (VOCNT). This study tool makes an important contribution to correcting the analysis-synthesis imbalance. VOCNT is published by B&H Academic Digital and though there is some possibility of future print release, it’s currently available primarily through LifeWay as a resource in the WORDsearch Bible study software platform. I had the opportunity to examine VOCNT in both PDF format and in WORDsearch, and as a long-time Logos user, I was reluctant to download and install WORDsearch. Fortunately, curiosity won out. The download and install were relatively painless and the interactive benefits of using the charts in the WORDsearch platform rewarded the effort. A screenshot of the tool in WORDSearch appears below. 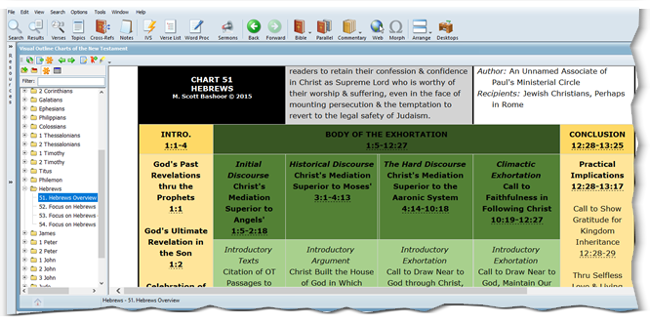 For each book of the NT, VOCNT provides a book overview chart. For longer books, the overview chart is followed by separate charts for each major section. For context, the section charts include portions of the overview chart, so you always see how the portion in focus fits into the flow of the book as a whole. Section columns flow downward, providing headings (bold print) and subheadings, each with the relevant Scripture portion references. Since the charts are compact by design, and contain many Scripture references, there’s a lot of value in being able to click references and view most, if not all, of each referenced portion in a hovering (tool-tip style) window. I noticed one minor glitch on my PC. The Scripture text pop-ups frequently say “Click link to see entire reference” at the bottom, but the pop-up disappears if I move the mouse pointer toward the link. This may well be the result of a configuration option in WORDsearch I have yet to locate. The charts all flow from general information toward increased detail as you move down the chart. The book-overview charts each begin with a three column/three block row containing chart title and topic info, a one- or two-sentence purpose statement, and a date-recipients-origination block. The image below is from the free sample available at www.bibleprism.com. Color schemes vary somewhat from book to book, helping users link section charts together with the book-overview chart—especially helpful if you’re browsing quickly through the collection. VOCNT is not the first visual outline tool I’ve used in Bible study. The first was a quirky but amazing volume a relative gave me for Christmas back the 80s or 90s, entitled Bible Panorama. That volume is dedicated to synthetical study of the whole Bible at an extremely accessible level. Years later, I came across a volume entitled Talk Through the Bible (a publication of the well-known synthetical Bible study ministry, Walk Through the Bible). It would be impossible to compare VOCNT and Bible Panorama. The differences are too numerous and similarities too few. A few comparisons with Talk Through the Bible are possible, though, and may be helpful to anyone familiar with that volume. VOCNT lacks TTB’s paragragphs and pages of thematic analysis, etc. This is great if the charts are what you’re looking for—minimizes distraction. VOCNT’s charts are far, far more detailed and comprehensive, though still compact enough to give you that “all at once” view of a book’s structure and flow. VOCNT uses color to convey information. This makes it possible to provide more detail while remaining compact. Like TTB, VOCNT does include a visual chart at the Bible-section level (such as historical books, Pauline epistles, etc.). This is included in the Appendix, along with a chronological chart of the NT and a timeline of the life and letters of Paul. This is quite a project, and creating it must have been both hard work and a whole lot of fun at the same time. A major upgrade that would enhance the tool in a future edition would be the ability to click a section/column in the book-overview chart and have it expand to the appropriate section level chart (and back again when you click another section/column). The whole thing might be more powerful as a web app. Creating a tool like this requires interpretive decisions, and the author isn’t always going to make the decisions users believe to be correct. For example, the Galatians chart identifies “ritual circumcision” as a focus of the book’s purpose, but my own view is that circumcision is only a figure of speech in Galatians, used by Paul as synechdoche for the false gospel of justification through abuse of Mosaic law. Further, though the section from 1:10-2:21 is accurately described in VOCNT as “Defense of Paul’s Apostleship: Autobiography of His Gospel Ministry,” the section has a theological agenda (his resistance to law-keeping for justification) in connection with the message of the epistle as a whole. For teaching purposes, I keep that theological agenda in focus in my own charts and outlines. A tool such as VOCNT, however, probably has to prioritize structure and remain a bit more general about thematic flow. It might take decades to study each individual book afresh to fine tune each chart section for emphasis. In that scenario, the best becomes the enemy of the good (in this case, the very good) and the project may never get done at all. I expect to find VOCNT valuable frequently in the future in my own Bible study efforts. I have personally found that creating my own charts is best, when I’m preparing to teach a book or section of Scripture. There’s nothing like pulling the pieces together for yourself to get a deep and enduring familiarity with the context for all the parts. Still, I’ve consistently found multiple outlines and charts by others invaluable in the process of creating my own. Whether as a tool to consult or as a stand-alone guide, I believe nearly any student of the NT would find VOCNT helpful. The tool is accessible enough to serve anyone who can read, but thoughtful enough to benefit advanced students engaged in English-Bible learning or teaching. One question for the author: When are you going to chart the OT, Scott? VOCNT’s author, Scott Bashoor serves as Pastor of Bible Church of Buena Park (Orange County, CA). Since 2002 he has been a Faculty Associate at The Master’s Seminary (Los Angeles). He holds degrees from Bob Jones University (BA, 1994) and The Master’s Seminary (MDiv, 1998; ThM, 2002), where he is currently pursing his PhD. Thanks for the review, Aaron. I've spoken with B&H Academic about producing an Old Testament version, but there's no official contract at this point. They're interested, and I'm interested. But it would take some time for it to come to completion. I have completed some OT charts. In fact,the first charts I ever created were for Isaiah class I taught. I would probably enhance those first and then go on to complete the rest of the Prophets. My guess is that is VOCOT would come out in stages. Glad VOCOT is not completely out of the question. It ought to be a seminary class, or two of them, chart the NT and another chart the OT. Great learning experience. Thought I'd share a link to a promo video that Master's Seminary just released on the book.